*Legally Kidnapped* And this is what #alienation looks like. 29 years ago I met a beautiful soul, Jim. I call him brother; Jim has an Intellectual disability. My parents adopted Jim and brought him into our home when he was five years of age. After 27 years of marriage our parents divorced and dad ended up remarrying. In 2013 our father died of complications of his military service (i.e. Agent Orange) and left his current wife as legal Guardian of Jim. My mother never gave up her rights to her son. My brother’s guardian has restricted him from seeing his mother and entire family that he grew up knowing. Driven to find freedom for my brother we’ve encountered countless days of unwanted stress. I have been accused or harassment while simply trying to see my brother. I miss him. His mom misses him. I’m simply trying to right this awful wrong! I’ve reached out to several political figures. I can only imagine the torment and pain my brother is going through. 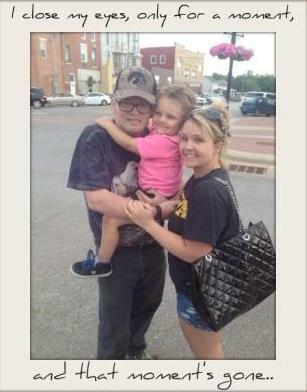 Finally, a year and a half after our father died I found my brother out in public in his hometown of Washington, IA. He seemed so lost and confused; he resembled a deer in headlights. He then stuck his arms out and hugged me. His caregiver, Libby, preceded to say he does not love you and doesn’t want to see you as she instantly called his guardian. My brother and my son were hugging as Jim’s guardian appeared. His guardian released my son from Jim’s arms and preceded to tell us we couldn’t touch him because she is his guardian and he’s her property! I have learned this is not just an issue for my family but others in Iowa and all over our country. Guardians should have limitations and the ward should be able to see and speak to whomever they wish if they are not dangerous, I have started an online petition. 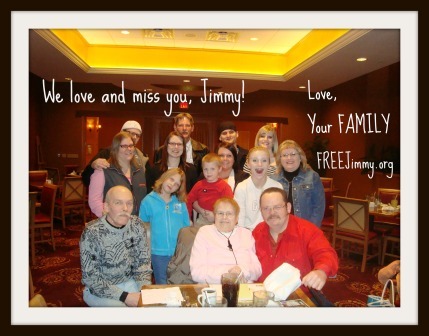 (See link http://petitions.moveon.org/sign/how-to-save-a-life-freejimmy-1 I also have a Facebook page https://www.facebook.com/guardianshiplaws that includes pictures and video of Jim and my reunion in the street!! There’s nothing on file stating we cannot see or communicate with one another only a suggestion by the Judge to improve communication between Dad’s second wife and myself. Guardianship laws need to be changed. Giving the voiceless a voice.